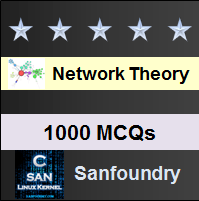 This set of Network Theory Multiple Choice Questions & Answers (MCQs) focuses on “Sinusoidal Response of an R-L-C Circuit”. 1. The particular current obtained from the solution of i in the sinusoidal response of R-L-C circuit is? Explanation: The characteristic equation consists of two parts, viz. complementary function and particular integral. The particular integral is ip = V/√(R2+(1/ωC-ωL)2 ) cos⁡(ωt+θ+tan-1)⁡((1/ωC-ωL)/R)). 2. . In the sinusoidal response of R-L-C circuit, the complementary function of the solution of i is? (D2+R/L D+1/LC)=0. The complementary function of the solution i is ic = c1 e(K1+K2)t + c1 e(K1-K2)t.
3. The complete solution of the current in the sinusoidal response of R-L-C circuit is? Explanation: The complete solution for the current becomes i = c1 e(K1+K2)t + c1 e(K1-K2)t + V/√(R2+(1/ωC-ωL)2 ) cos⁡(ωt+θ+tan-1)⁡((1/ωC-ωL)/R)). 4. In the circuit shown below, the switch is closed at t = 0. Applied voltage is v (t) = 400cos (500t + π/4). Resistance R = 15Ω, inductance L = 0.2H and capacitance = 3 µF. Find the roots of the characteristic equation. On differentiating the above equation and on solving, we get roots of the characteristic equation as -37.5±j1290. 5. Find the complementary current from the information provided in the question 4. Explanation: The roots of the charactesistic equation are D1 = -37.5+j1290 and D2 = -37.5-j1290. The complementary current obtained is ic = e-37.5t(c1cos1290t + c2sin1290t). 6. The particular solution from the information provided in the question 4. Explanation: Particular solution is ip = V/√(R2+(1/ωC-ωL)2 ) cos⁡(ωt+θ+tan-1)⁡((1/ωC-ωL)/R)). ip = 0.7cos(500t + π/4 + 88.5⁰). 7. The complete solution of current from the information provided in the question 4. Explanation: The complete solution is the sum of the complementary function and the particular integral. So i = e-37.5t(c1cos1290t + c2sin1290t) + 0.7cos(500t + π/4 + 88.5⁰). 8. The value of the c1 obtained in the complete solution of question 7. Explanation: At t = 0 that is initially the current flowing through the circuit is zero that is i = 0. So, c1 = -0.71cos (133.5⁰) = 0.49. 9. The value of the c2 obtained in the complete solution of question 7. Explanation: Differentiating the current equation, we have di/dt = e-37.5t (-1290c1sin1290t + 1290c2cos1290t) – 37.5e-37.5t(c1cos1290t+c2sin1290t) – 0.71x500sin(500t+45o+88.5o). At t = 0, di/dt = 1414. On solving, we get c2 = 1.31. 10. The complete solution of current obtained by substituting the values of c1 and c2 is? Explanation: The complete solution is the sum of the complementary function and the particular integral. So i = e-37.5t(0.49cos1290t + 1.3sin1290t) + 0.7cos(500t + 133.5⁰).